Kamadhenu cow (Sanskrit: K?madhenu), Kamadugha, Kamaduh also known as Surabhi (Surabh? ), is a divine heavenly goddess mentioned in Hindu mythology as the mother of all cows. Kamadhenu cow is also depicted in the ancient Vedas as the cow of wish or desire . When Brahma himself concluded Surabhi cows austerities he appeared before them and granted their wishes and blessed them with the benediction that cows would eternally be the sustainers of all creature creatures. 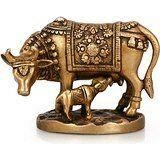 Size : 4 Inches Height X 5.5 Inches wide X 2.5 Inches depth, Weight : 850 Grams, Material : Brass, Features:- Made from Quality Quality Brass and Handmade in India, Kamadhenu cow is supposed to fulfill all desires, so it is depicted as cow of innumerable fulfillment of wishes -------------- Pls beware from Copy product & ensure buying authentic product. This is exclusive product of Brand " Collectible India" and "covered by intellectual property rights laws". 'Collectible India' do not authorize any other Brand/Seller to sell it and won't be responsible if any copy or substandard product send by any other seller.